Va'al wrote: If your plan is to have a nice, uniform display, the IDW Collection are great volumes for that sort of thing. I'm more of a trade paperback reader, so would personally recommend the TPBs instead. By those three you mention, do you mean the collected works for each of those characters? If not, there are recent TPB collections that include pretty much all recent stories about all three (and again, I think that's what you're referring to!). Yeah, I was referring to the recent/upcoming TPBs. Essentially, I’ve been collecting these big hardcover collections, but I’m considering switching formats to get more of what I like. My question is if there are any good stories in the ongoings that I might like that would make it easier to just continue with the hardcovers. I know that you’re not really gonna know exactly what I like, but I tend to be on the same boat as the rest of the fandom, if anyone has advice. Looking into my somewhat faulty crystal ball, I expect the Phase 2, Volume 9 hardcover to be Combiner Wars and Sins of the Wreckers, probably with Redemption and the Windblade II #5-7 issues in there as well. If you've been keeping up through Phase 2, vol 7 (may have been mentioned, I was lazy and didn't click back) I don't see reason to get the other character volumes since most of their material is covered at that point - except for one big reason: Time. Probably a year or a bit longer before Vol 9 comes out. ScottyP wrote: Looking into my somewhat faulty crystal ball, I expect the Phase 2, Volume 9 hardcover to be Combiner Wars and Sins of the Wreckers, probably with Redemption and the Windblade II #5-7 issues in there as well. If you've been keeping up through Phase 2, vol 7 (may have been mentioned, I was lazy and didn't click back) I don't see reason to get the other character volumes since most of their material is covered at that point - except for one big reason: Time. Probably a year or a bit longer before Vol 9 comes out. Okay, so the thing is that I haven’t gotten 6 and 7 yet. I already have Dark Cybertron from a while back, so 6 would only be new with Windblade and 7 seems to be story arcs I don’t really care about too much. I also have collected only parts of phase 1 (namely Furman’s stuff, Last Stand, and Chaos) through different mediums, so this wouldn’t throw things off too much. It’s really all about this: Does Dark Cybertron shake up the ongoings too much, and do I need to read them to understand the Redemption stories and Windblade mini-series? 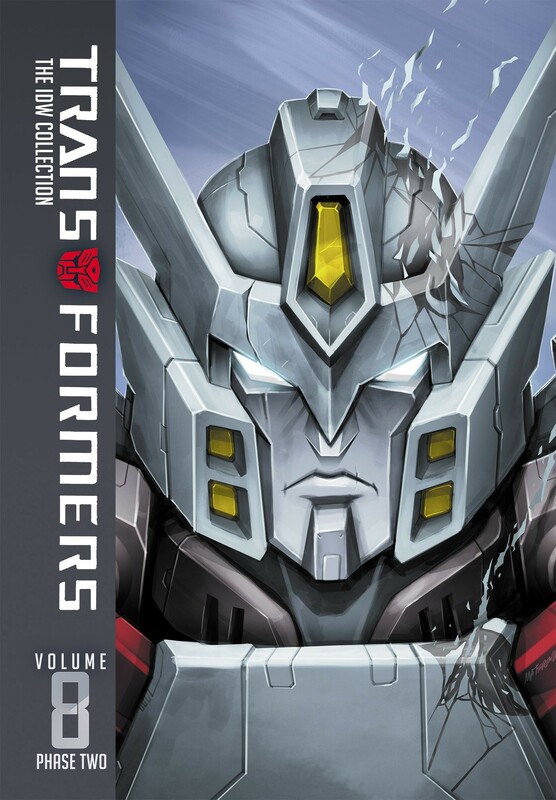 Thanks to a listing over on online retailer Amazon.com, we have the cover art image for the latest collected hardcover volume of the IDW Collection for Phase two of the Transformers comics, featuring another peeling character from the cast, Drift. The art appears to be once more by Marcelo Matere (as his signature shows), though no credit is given in the listing itself, and is appropriate as the volume includes Transformers: Drift - Empire of Stone, along with Transformers: More Than Meets The Eye issues #35-40, Transformers: Robots in Disguise issues #35-38, Transformers: Punishment. Find out more below! Presenting IDW's Transformers comics in recommended reading order, including one-shots, crossovers, and event series! It's everything a beginner could need, everything a diehard could want. Rodimus leads a team of Autobots into Cybertron's past, pursuing the Decepticon double-agent Brainstorm who plans on killing Orion Pax before he can become Optimus Prime. Meanwhile, on Earth, Prowl is left in command gathering his allies, the Constructicons, to search for the one human he holds a grudge against, Spike Witwicky. Then, Drift returns! After leaving the Autobots in disgrace, he's now alone, on a mission to clean up the darkest depths of the galaxy. Collects Transformers: More Than Meets The Eye issues #35-40, Transformers: Robots in Disguise issues #35-38, Transformers: Punishment, and Transformers: Drift - Empire of Stone. I’m still flip-flopping on what comics to buy next, and it all comes down to whether or not I’m interested in the ongoings after Dark Cybertron. Fellow Seibertronian Grimlocktimus has dropped us a note regarding a new pre-order listing on online retailer Amazon.com, for another IDW Publishing Transformers Phase Two Collection volume, due in June 2019. 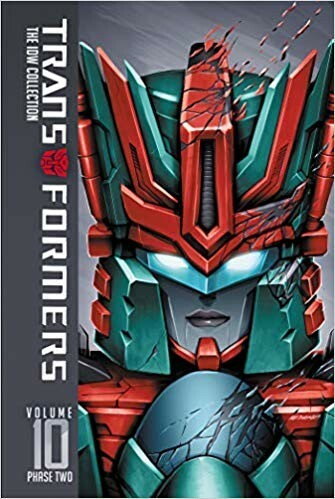 This volume is listed as Phase 2 Volume 9, and features the Transformers issues #39-43, More Than Meets The Eye issues #41-44, and Windblade Volume 2 issues #1-5. There is no cover listed for the Volume, but we should expect Marcelo Matere or Sara Pitre Durocher to provide one in the near future. You can find the description below, and let us know what you think of the upcoming collections continuing on in the comments section below! The Autobots and Decepticons' uneasy peace is threatened by the flames of war! Starscream, ruler of Cybertron, makes contact with Windblade's homeworld--and the only defense against a new Cybertronian Empire is the Combiners--multiple Cybertronians joining together into huge, dangerous forms! Collects Transformers issues #39-43, More Than Meets The Eye issues #41-44, and Windblade Volume 2 issues #1-5. Hey. So, if anyone is reading this in the future, wondering what conclusion I came to because they have similar questions: I continued with the collections, partially because I realized the Dinobots story arc doesn't come right after Dark Cybertron like I thought it did because I misread something. This is a little bit weird, but I know I would appreciate a conclusion if I was following old forms because they were discussing something I had a question about. The IDW Collection just keeps trucking along! With IDW Collection Phase 2 Volume 9 due out in June of this year, we now have the pre-order for the next Volume in the line, Volume 10! Volume 10 can be found and pre-ordered HERE from Amazon.com and rings up at a $49.99 pricepoint, on par with the past releases. This new volume even has a cover, and it is the combined form of the mighty Torchbearers: Victorion! The cover artwork has been done by Sara Pitre-Durocher, who has become a staple of the newer IDW Collection books. This volume collects issues #44-45 of The Transformers series, issues #45-49 of More Than Meets The Eye, issues #6-7 of Windblade, the Sins of the Wreckers mini-series, the Combiner Hunters one-shot, and the Holiday Special. Check out the cover and product description below, and let us know what you think in the comments section below! On Eukaris, the colonists are more than just robots in disguise--they're whole new breeds of TRANSFORMERS! But while Windblade and Starscream struggle to gain allies on this brave new world, an ancient power seeks to force them off the planet! Plus, Windblade and Chromia team up with Arcee to put an end to the menace of the COMBINER WARS--but will they end each other first?! In Sins of the Wreckers, the Autobot strategist Prowl is missing, drawn into a familiar web of vengeance and manipulation. The Autobots' darkest secrets are about to be exposed by their greatest human ally. And, the crew of the Lost Light are caught off guard when a dead friend appears out of the blue. But there's no time for a happy reunion: someone else has found his way onto the ship--someone with the power to tear the crew apart. Collects issues #44-45 of The Transformers series, issues #45-49 of More Than Meets The Eye, issues #6-7 of Windblade, the Sins of the Wreckers mini-series, the Combiner Hunters one-shot, and the Holiday Special. 3,992 pages were recently viewed by 538 unique visitors. This page was viewed 1 times on Thursday, April 25th 2019 12:59am CDT. © 2019 Seibertron, Inc. DBA Seibertron.com. All Rights Reserved. Established June 2000. Seibertron.com is owned by Ryan Yzquierdo.